They cut big stones to build the temple. One stone was the wrong shape and size. They threw it away. Later, they realized that they needed one the exact shape and size of the one that was discarded to fix two walls together. So, they found the stone that they threw away and put it in an important place at the top of the two walls. It held the two walls together. Psalm 118 is the sixth of the Egyptian Hallels. A Hallel is a Jewish prayer, a verbatim recitation from Psalms 113–118 which is recited by observant Jews on Jewish holidays as an act of praise and thanksgiving. The are named Egyptian Hallels because the theme of the Psalms made the Jews think of what God did in Egypt. He led them from Egypt hundreds of years before. He made them free. But he also led them from Babylon 900 years later. He made them free again. So the psalm starts, “Thank the LORD because he is good”. Here, God agrees to love and give help to his people. They agree to love and obey him. The account the psalmist here gives of his troubles is very applicable to those of Christ. Many hated him without cause. The Psalm is reminding us that God is sometimes the strength of His people even when He is not “their song.” Yes, we always have God’s support even when what we want is God’s delights but cannot see them. Whether the believer traces back his comfort to the everlasting goodness and mercy of God, or whether he looks forward to the blessing secured to him, he will always find abundant cause for joy and praise. Every answer to our prayers is an evidence that the Lord is on our side. We need not fear what man can do to us. Our call is to trust in Him alone to accept us and bless us. His humiliation; He is the Stone which the builders refused: they would go on in their building without Him. This proved the ruin of those who would make light of Him. Rejecters of Christ are rejected of God. His exaltation; He is the chief Cornerstone in the foundation. He is the chief Top-stone, in whom the building is completed, who must, in all things, have the preeminence of our faith. Christ’s name is wonderful and the redemption He brought us is the most amazing part of all God’s wondrous works. We should rejoice and be glad in the Lord’s day. The psalmist praises God, and calls upon Him to give thanks to God for the glad tidings of great joy to all people, that there is a Redeemer. Based on this Psalm, what has God done for His people? Is there anything that God has not done? What evidence do you have that God answers prayers? 1 As they approached Jerusalem and came to Bethphage and Bethany at the Mount of Olives, Jesus sent two of his disciples, 2 saying to them, “Go to the village ahead of you, and just as you enter it, you will find a colt tied there, which no one has ever ridden. Untie it and bring it here. 3 If anyone asks you, ‘Why are you doing this?’ say, ‘The Lord needs it and will send it back here shortly.’” 4 They went and found a colt outside in the street, tied at a doorway. As they untied it, 5 some people standing there asked, “What are you doing, untying that colt?” 6 They answered as Jesus had told them to, and the people let them go. 7 When they brought the colt to Jesus and threw their cloaks over it, he sat on it. 8 Many people spread their cloaks on the road, while others spread branches they had cut in the fields. 9 Those who went ahead and those who followed shouted, “Hosanna!” “Blessed is he who comes in the name of the Lord!” 10 “Blessed is the coming kingdom of our father David!” “Hosanna in the highest heaven!” 11 Jesus entered Jerusalem and went into the temple courts. He looked around at everything, but since it was already late, he went out to Bethany with the Twelve. 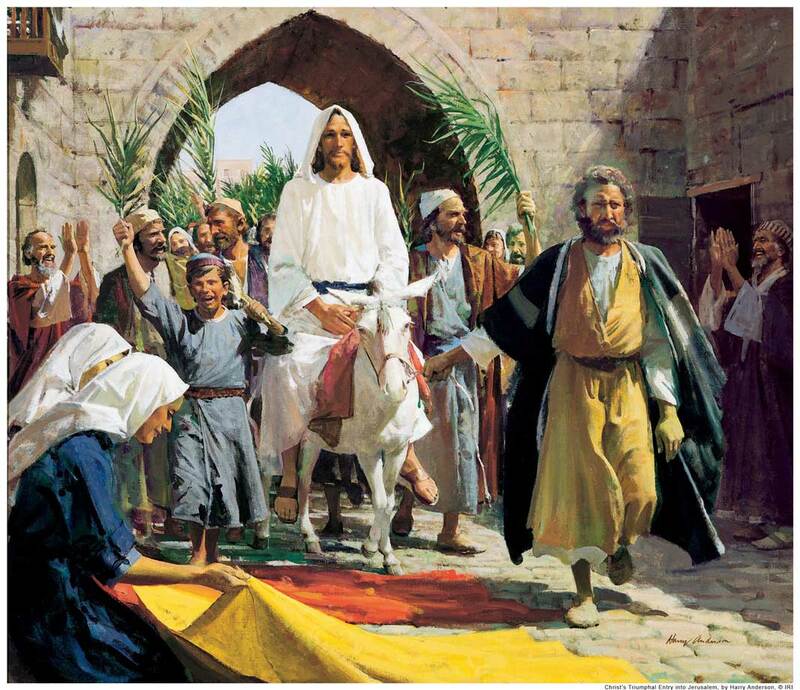 Christ’s coming into Jerusalem on Palm Sunday shows that He was not afraid of the power and malice of His enemies. His actions would serve to encourage His disciples who were full of fear. It also shows us that Christ was not worried about His approaching sufferings. Christ would be treated as a king and in a few days, humiliated, beaten, and killed. We are to learn from His example that these matters should teach us not to seek the high things of the world but to make sure we do not miss the important but lowly things of the world. God has promised us not to abandon us, He has promised us forgiveness, God has promised us eternal salvation. What king would not want such an assurance. The good news is that it has been given to us by Christ Himself. How can we recognize those things in the World that are a danger to our own eternal salvation? Why does self interest always win? What do you think the impact of social media would have had on Psalm Sunday if it were around back then? The people literally “Shirts off their backs” – Yet in a few days would call for His death. What do you think were the influences on those people that allowed them to change so quickly? Do you think people know Christ well enough to recognize Him if he came into our Church today? Why or Why not? What can we do about that concern?